Spirited but friendly competition was evident at the 2012 DCN Finals as three former champions balanced precision and crowd appeal to rise to the top of the Premier Class. Gold medalist Juliana (79.35, high visual, GE and field music) won the title for the second consecutive year and is making plans for a U.S. tour in 2013. 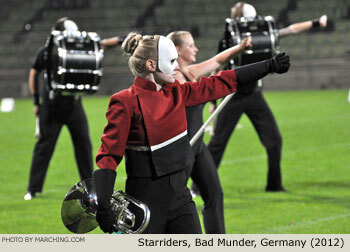 Silver medalist Jubal (78.3, high percussion) and bronze medalist Beatrix (74.2, high color guard) successfully held off a challenge from Starriders, one of three German units in the contest. Jong Jubal, Johan Friso and Jong Beatrix earned medals in the Junior Class. 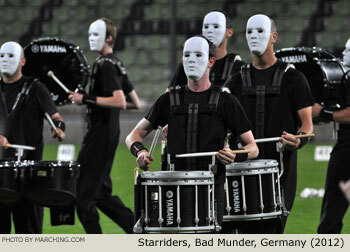 The 15 units from the 2012 DCN Finals are pictured here in reverse order of appearance. 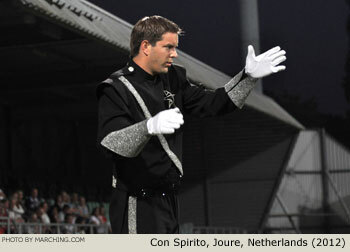 For more information visit DrumCorpsNederland.nl or the Netherlands marching links on Marching.com. 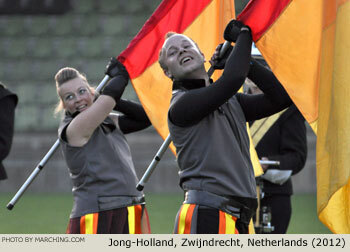 Photos by Ken Martinson/Marching.com and Maarten van het Hof/ DrumCorpsMedia.com.